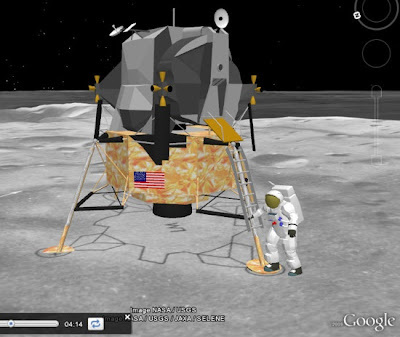 To mark the 40th anniversary of the Apollo 11 moon landing on July 20, 1969, Google on Monday released Moon in Google Earth, which allows users to explore lunar images and related lunar content. In a post on the official Google (NSDQ: GOOG) blog, Anousheh Ansari, the first female private space explorer and a trustee of the XPRIZE Foundation, says the software will help millions of people learn about space. "Moon in Google Earth enables you to explore lunar imagery as well as informational content about the Apollo landing sites, panoramic images shot by the Apollo astronauts, narrated tours and much more," she explains. "I believe that this educational tool is a critical step into the future, a way to both develop the dreams of young people globally, and inspire new audacious goals." If you re-start Google Earth right now, you can see the Moon in 3D! Look for the little planet icon in the upper middle of Google Earth and you'll see a new option "Moon". 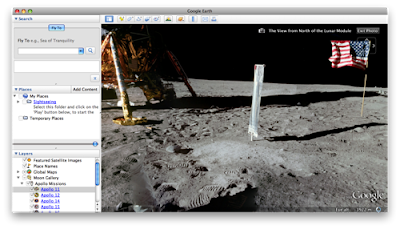 The new moon in Google Earth changes the virtual globe into a 3D rendition of the moon. The terrain of the moon is in 3D and there are layers telling you more about the moon. The first thing you should check out in the new Google Earth moon mode is the awesome Apollo 11 tour found in the layers under: Moon Gallery->Guided Tours->Apollo 11. This tour is narrated by Andrew Chaiken and Astronaut Buzz Aldrin and is one of the best illustrations of the Apollo 11 mission I've seen to date! 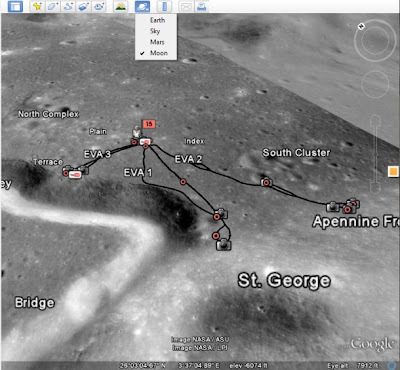 Four years ago to the day, Google launched Google Moon, a way to explore the Moon using its Web-based Google Maps service rather than Google Earth, a desktop application. There's also a Google Maps-based Mars. Other extra-terrestrial layers in Google Earth include Sky and Mars. There's also an Ocean layer, which was launched in February with the release of Google Earth 5.0.Moon in Google Earth details all of the Apollo landing missions, and offers lunar surface panoramas in Google's Street View format. So far, there have been no privacy complaints. Google's Moon project is a result of the company's Space Act Agreement with NASA. Japan's space agency JAXA also helped out by donating a global terrain dataset of the Moon. And finally, with respect to the Google Doodle problem, a picture that doesn't look like it was whipped up in five minutes appeared on Google's homepage at around 3 PM (Eastern Time).